Dorothy C. Prochniak, age 102, passed away Saturday, April 13, 2019 at Willowcrest, South Milwaukee. She was born in Racine, April 4, 1917, daughter of the late Julius and Fredricka (Nee: Schmidt) Kuhnwald. On October 3, 1936 at St. John Nepomuk Catholic Church she was united in marriage to William B. Prochniak who preceded her in death in 1985. 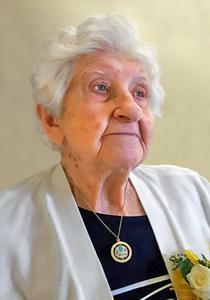 Dorothy was a longtime member of St. John Nepomuk Catholic Church. She enjoyed knitting, growing violets and volunteering for Toys for Tots at home by making doll clothes. She was a loving and devoted mother, grandmother, great-grandmother, and great-great grandmother who will be dearly missed. Survivors include her children, William (Colleen) Prochniak, Mary Mauer, Diane (Wayne) Halkowitz, Susan (David) Schroeder; her grandchildren, Shelli (Ron) Dobrowski, Rich (Lori) Mauer, Jon (Courtney) Mauer, Alisa (Frank) Copeland, Laura Schroeder (David Smades), Nicole Brannon, Wanda Neff, Lisa (Tom) Aiello, William (Lydia) Bausch; her great-grandchildren, Brittany, Brandon, and Brett Dobrowski, Samantha, Erica, Jake, and Amber Mauer, Jason and Aeson Copeland, Charlie and Abby Smades, Jonah Baunoch, Ryan Worden, Jeremiah Arneson, Erica (Nick) Puffer, Ashley Riffer, Cody Alderson, Dylan Bausch; five great-great grandchildren, Hailey, Alyssa, Levi, Carson and William; two special nieces, Lucille Lutz and Barbara Vollmer; many other nieces, nephews, relatives and dear friends. In addition to her parents and husband she was preceded in death by her son-in-law, Peter Mauer; great-grandson, Zachary Worden; and brothers and sisters, Carl, Gustav, Paul, Ernst, and William Kuhnwald, Alma and Martha Kuhnwald. A Mass of Christian Burial will be celebrated Wednesday, April 17, 2019, 11:00 am at St. Monica’s Senior Living, 3920 North Green Bay Road with Rev Fred Paggart OSA officiating. Relatives and friends may meet with the family Wednesday at St. Monica’s Senior Living from 10:00 am until time of Mass at 11:00 am. Private interment will be held at Holy Cross Cemetery, Hwy 32. Memorials to Toys for Tots have been suggested. A special thank you to the staffs at St. Monica’s and Willowcrest for their loving and compassionate care, also to Kathy Cook for her kindness shown throughout the years.